Dusk Till Dawn in United Kingdom is a leading place to play poker. It is celebrating Grand Prix Poker Tour events in all over UK, where you as a player can participate to many events for using a buy in of just $109. This is highly popular and one of the most successful events in United Kingdom which attracts thousands of poker players every year. Because of its popularity and lots of entries, the event will be held at some iconic football stadiums. 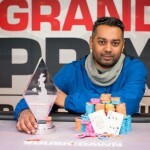 The guaranteed prize pool for the Grand Prix Tour is $250,000; meanwhile the winner is expected to receive a handsome amount of $35,000 as first prize. The £500 high roller is also on the card. 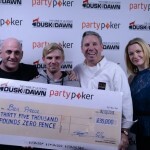 The event starts on March 23 and will continue till March 27 at Aspers Milton Keynes. The next round of event would be held at Aspers Newcastle from April 13-17. It would stop at Broadway Birmingham from April 20 to April 24. At Manchester 235 from April 27 to May 1. At Rainbow Bristol from May 4 to May 8. Next event would be From June 8 to June 12 will be played at Apsers Milton Keynes. It would be at Rendezvous Brighton from June 15-19. Another event is at Rainbow Bristol from June 29 to July 3. July 6 to July 10 at Aspers Newcastle. It would be held at Broadway Birmingham from July 13 to July 17. The next round of tournamnets would be at from July 20-24. August 17-21 and the place is Aspers Milton Keynes. Rainbow Bristol will host another event from sept. 7 to 11. Manchester 235 will host again from Sept.28 to October 2. Another event at Aspers Newcastle from October 5 to 9. Broadway Birmingham (Oct. 12-16),Aspers Milton Keynes(Nov. 9-13),Rendezvous Brighton(Nov. 16-20) and Rainbow Bristol(Nov. 30-Dec. 4).